Oddsmakers are adjusting for a Trump victory. If you had taken a bet at the beginning of the Republican primary that Trump would win that race, $1000 might have bought you a condo in Vail. That same $1000 might buy you a chalet in Switzerland, if you had bet that Trump would be president. Hillary Clinton has been a foregone conclusion, and the Left demonstrates daily the level of crookedness they will support for her victory. However despite all that is against Trump, the odds are swinging back in his favor. Despite a calamitous week of campaigning, betting markets on the US election are almost a mirror image of those on Britain’s EU referendum at this stage. And they could be pointing to a victory for Donald Trump. Bookmaker William Hill says 71 per cent of the money so far staked is for Democrat Hillary Clinton. But 65 per cent of the bets by number are for the controversial Republican. That means a lot more punters are putting smaller bets on Trump, almost exactly the same pattern as was seen in the run up to the Brexit vote when the money was for Remain but the majority of bets were for Leave. 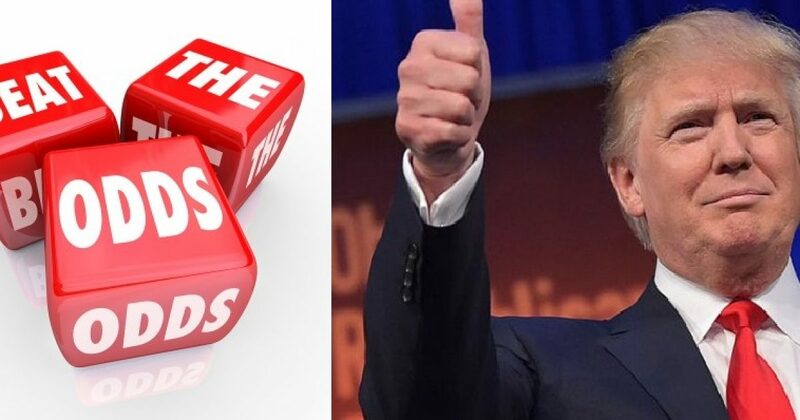 The bookie has cut the odds on a Trump victory from 11-2 to 4-1 over the past two days in response to a surge in bets for the reality TV star and businessman turned politician. It comes despite a campaign bedevilled and derailed by ugly accusations of sexual abuse on the part of Trump from a growing list of women, together with his claims that the election is somehow being “rigged”. Trump’s appeal is not Romneyesque. Thus, people will show up to the polls and pull the lever for Trump, and not just against Hillary. Sadly, I only wish I had bet at the previous odds. Oh well, perhaps I can get in on the betting before Trump is considered the favorite.